A couple Fridays ago Nini and Grandpa came over to watch Sophie, and Andy and I went on a date. 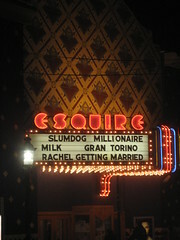 We saw Slumdog Millionaire at Esquire Theatre. It’s a love story. Although difficult to watch at times it was one of the best movies I’ve seen in a long time. 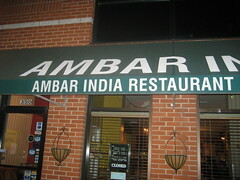 We then, appropriately, had dinner at our favorite Indian restaurant, Ambar. In the past, we’ve left Sophie with my parents only to discover that she cried—for hours. But on this night, my mom and dad said she was so, so very happy. I think she really knows them now, which makes me feel good. She played and laughed, my parents gave her a bath, and then my mom rocked her to sleep. 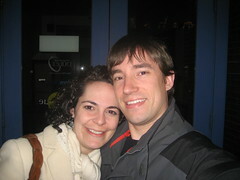 And Andy and I enjoyed a much-needed night out. This entry was written by kara, posted on January 19, 2009 at 10:49 pm, filed under Uncategorized. Bookmark the permalink. Follow any comments here with the RSS feed for this post. Post a comment or leave a trackback: Trackback URL.